When Does House Paint Expire? The time it takes for house paint to expire varies by manufacturer. There are also other factors that will determine the shelf life of paint. Those factors include whether the paint has been opened, where the paint is stored, and what the paint is stored in. There are simple ways that will help to extend the shelf life of your paint. Unopened cans of paint have a shelf life of two to five years, according to various paint manufactures. Paint cans that have been opened have a shelf life of approximately six months if not properly stored. 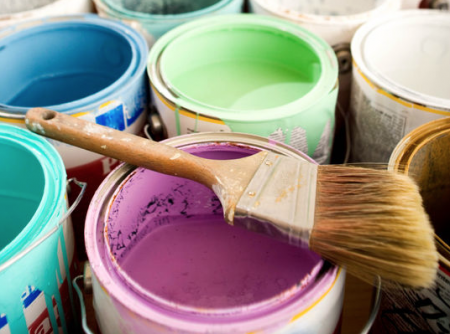 A can of paint can last longer than five years if it has never been opened and exposed to air. The rim of your paint cans are an important factor in how long your opened can of paint will last. Some people paint straight out of the can. This often leaves the rim of the can coated with paint. A rim full of paint makes it difficult to replace the lid tightly. It is best to pour the paint into a paint pot and clean the rim thoroughly before replacing the lid. Tap the lid down with a hammer after each use to keep the paint from being exposed to air. Partial cans of paint are best emptied into an airtight plastic container. Use a container that will hold the amount of leftover paint. If you have a quart of paint left in your can, use a quart size container. The less air inside of the container the longer the paint will last. Use plastic wrap to cover the paint can before you replace the lid. The plastic will help to keep air out of partially full cans of paint. Cut a piece of wax paper the same size as the inside of your paint can. Place the wax paper directly on top of the paint. This provides a cover for the paint and helps eliminate air exposure inside the can. Closed cans still have an air pocket if they are not completely full. The best method would be to use both wax paper and plastic wrap. The less air that can get to the paint, the longer it will last. Temperature plays a big role in how long paint will last before it expires. If you allow your paint to freeze, the shelf life will be greatly reduced. Freezing and thawing breaks down the paint's ability to bond, and it will become a hardened rubbery lump inside the can. Store your paint where it does not get less than 50 degrees. You can still use your paint after 5 years, as long as it has been properly stored and will still mix.well. Purchase new paint if it has become a lumpy mess that will not mix. Server responsed at: 04/23/2019 6:21 a.m.